Oh, it’s getting cold out there! Good job we’ve got a thick pair of boots on when we go out for a walk, but spare a thought for our pets! Not only do they have to brave the cold on their paws, there’s other things that can affect them too. Here’s a quick breakdown of the issues your pet can face in the winter months, and what you can do about them. The salt that local councils use to keep the roads and pavements ice free can cause chemical burns on dogs’ paws. Sometimes, keeping your dog away from de-icing salt can be impossible. If they’re in contact with de-icing salt for a short period of time it should be OK, but here’s a few things you can do to reduce the risk of any pain. If it’s really cold and your dog is out for a long time, it’s possible for ice balls to form in between the pads and toes of dogs with hairy paws. As cars start to freeze during the night, more and more people will be using de-icer on their windscreens before they go out. This can be harmful to your pets if they ingest it. Avoid any spills or leaks. Sometimes the liquid can drip off your car and make a small puddle on the ground, pets can then lap this up – causing them a lot of harm. 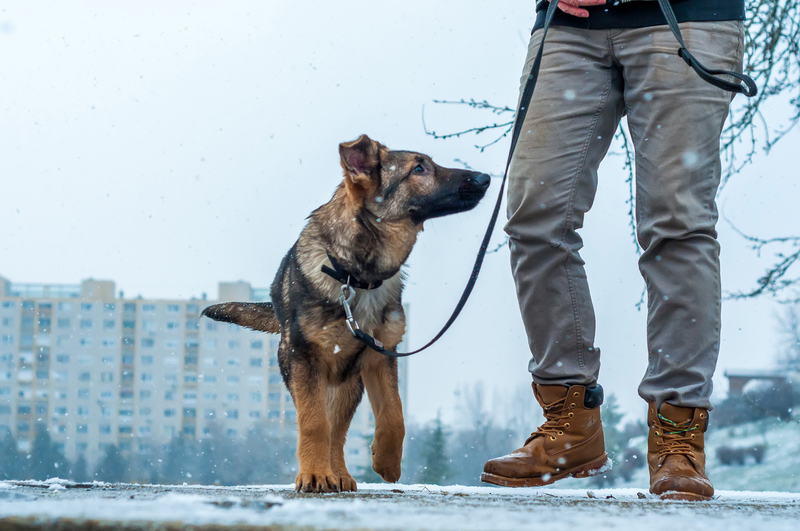 If you notice your pet is particularly struggling with the cold weather, or you know it’s going to be cold for a long time, it might be worth purchasing a soothing cream for their paws after walks. We like the Oatmeal Paw Butter from Pet Head. Designed specifically for dogs, its natural ingredients helps soothe paws, and we’ve found it also doubles up as a great way to keep their paws smooth in the summer months. If you’re looking for an extra level of protection, you’ll probably want to pick up a pair of Hurtta boots. They’ll keep your pooch’s paws safe from the elements and are perfect for walks across varied terrain. Don’t forget, we’ve got a great range of winter coats, reflective wear and supplements to help your dog fully enjoy their winter walks this year.